I was working on some thank you cards for Christmas gifts that I received. This one is what I would call a gender-neutral card, one that could be given to either a woman or a man. 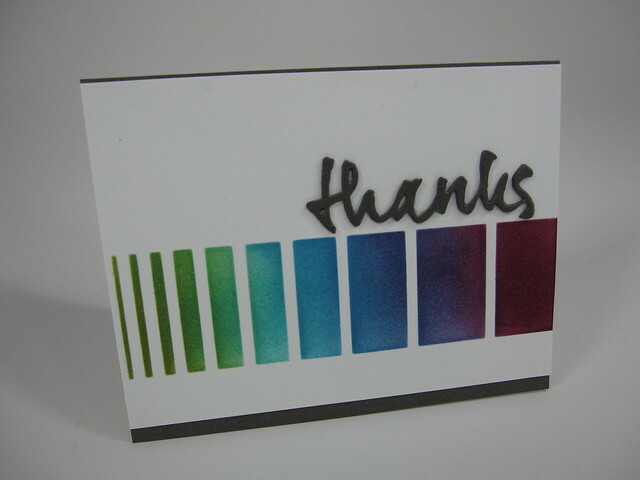 The graphic blocks on the front of the card were made using a Simon Says Stamp stencil, Gradated Blocks. I selected three Stampin’ Up inks: Pear Pizzazz, Tempting Turquoise, and Rich Razzleberry and blended them across the stencil openings using a Ranger mini ink blending tool (the one with the round foam applicator). The die-cut sentiment was created using a die from Papertrey Ink’s Wet Paint Cuts Die Collection. I love the script look of the font, not too feminine and not too masculine. It’s just perfect for the gender-neutral look I wanted. I die-cut 3 of the sentiments and glued them on top of each other to add dimension to the sentiment. The bottom 2 layers were from gray cardstock that I had and the top layer was cut from metallic shimmer paper in a color called Gunmetal. Unfortunately, my photo of the card does not pick up the shimmer. The card front was trimmed down slightly from the standard A2 dimension and I mounted the card front onto an A2 piece of the same metallic shimmer paper, letting the shimmer paper show on the top and bottom of the card front. This was then mounted on a horizontal, top-folding A2 card base. I can’t get away from those layers of cardstock! I used a tip from Laura Bassen, one of my favorite card makers! Laura has such a great sense of color and the use of it for impact. She loves blending bright colors together. In several of Laura’s videos she suggests that to achieve great blended colors, blend them in the same order as they would appear on the color spectrum. That way the blending looks more natural and you avoid a muddied look. Thanks for that tip Laura! I took Laura’s class called Vibrant Stamping: Creative Color Techniques on this (new to me) website: craftsy.com and really enjoyed it. It gave me inspiration and tips on how to use color more effectively in my card making. I’m not advertising anything here on my blog. I’m just letting other card makers know what I like and what inspires me. This entry was posted in Uncategorized and tagged Gender-Neutral. Bookmark the permalink.